Each year, designer and all-around face of Magic Mark Rosewater uses his weekly column over at the mothership to look back on the previous year and reflect on its highs and lows, failures and successes. These annual “State of Design” features are insightful reading, giving an insider’s perspective into the block gone by. A year on it’s easy to overlook, but buried within last year’s feature was this little gem: 2011 Goal #2: Combine nostalgia with innovation. I’ve talked numerous times about how the nostalgia from Time Spiral was successful with one portion of the audience while a failure with another portion. One of the experiments of Scars of Mirrodin block was to find a way to tap into nostalgia through some means that didn’t turn off the less enfranchised player. This dovetails into another point Rosewater makes in the same piece, discussing the Five Stages of Design. In a nutshell, the game has had five evolutionary phases since it began nearly two decades ago, and starting with Scars of Mirrodin we are in the fifth. An easier way to see this might be to talk a little bit about Innistrad. What is Innistrad’s design based upon? Nothing mechanical. Innistrad is about bringing the horror genre to life. Graveyard and tribal themes are mechanical tools to help do this, but neither of those themes drove the design. Both were tools to bring the design to life. These intersect in a novel way with the second recent block to revisit an old world, Return to Ravnica (and as an interesting aside, the original Ravnica kicked off the Fourth Stage- block planning). In fairness, Wizards had a fair head start with Return to Ravnica, based as it is upon one of the best-loved sets and worlds in the history of the game. To bring these elements together, the guilds were given a fresh coat of mechanical paint. This wouldn’t be a full-on revisit in the mein of Time Spiral, but rather a new introduction to the game world. To tie together the elements of the past and present so necessary to weave currency and nostalgia, however, Wizards set about looking to integrate the mechanics with their earlier iterations wherever it was feasible to do so. Both guilds we’ve covered so far- the Selesnya and Golgari– are superb examples of this. The original Selesnyan mechanic was convoke, which let you pay less for expensive spells by tapping your creatures. It’s no stretch to see how a mechanic that adds to your creatures reinforces this aim. Or take the scavenge of the Golgari. Play any dredge deck and one thing becomes clear- you quickly end up with a ton of cards in your graveyard. Many of them make viable dredge targets of their own, but just as frequently you could end up staring forlornly at another Golgari Brownscale. Scavenge gives your dead cards a way to be relevant to your creatures in play, and can augment your existing army. Naturally, there were some mechanics that were beyond salvage, and Wizards abandoned the effort to force the issue. Today’s guild is one of these. In the original Ravnica, the Rakdos played with the hellbent mechanic, with cards that gained a power boost if you happened to have an empty hand. This was meant to convey a hell-for-leather approach, the abandonment of any and all careful consideration and planning in return for the advantage of a moment. 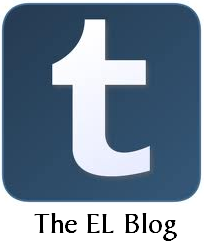 It was clever, it was flavourful- and it played poorly. Indeed, Rakdos Bloodsport was tied only with Gruul Wilding for being the worst Theme Deck of Ravnica block- and it wasn’t close. Still, the sense of cashing in long term advantage for short-term gain is a staple trope in Red and Black, so Wizards returned to the drawing board and came back with unleash. Unleash is intriguing precisely because it gives you a choice, and a far easier one to enact than finding creative ways to dump your hand (see: Ignorant Bliss). Whenever you cast a creature with this keyword, you get to decide: leave it as-is, or give it a +1/+1 counter in exchange for it forfeiting the ability to block. Although this casts it solely in the realm of creature combat (hellbent was more versatile, appearing on other card types as with Cackling Flames), it does a much better job overall of making the guild be something you want to play with. Oh, and all the “evil carnival” repainting doesn’t hurt matters, either. If you had to sum up Rakdos Raid in a nutshell, you could do worse than to say “aggro beats with a minor discard subtheme.” By and large, almost everything the deck has to offer goes into the former. It opens with a trio of Tormented Souls, whose unblockability promises a small but steady trickle of damage over the course of the game if left undealt with. The fact that they can’t block puts them in good stead with your unleash cards like Rakdos Cackler, a one-mana 1/1 that will usually see life as a 2/2. To top things off, you also have a Bellows Lizard, another 1/1 but one with an expensive version of Firebreathing. Rakdos Raid is a cheaper deck than many judging by the mana curve, and the Lizard offers a good outlet for excess mana later in the game. It’s not great, but this does make it a shade more relevant when drawn later in the game than its cohorts. 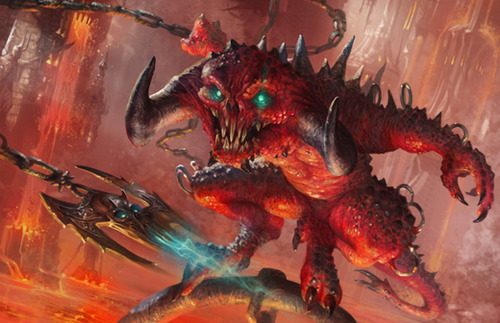 The Rakdos Shred-Freak leads us into the two-drops. There’s not much to see here- a 2/1 with haste, but haste is another ability that has a funny way of being relevant even when placed on smaller bodies. If you’d prefer something a little more robust, how about the Gore-House Chainwalker? Also a 2/1, this Warrior has the ability to come into being as a 3/2, so long as you don’t want him to stick around on defense. Three power for two mana is a fine deal, particularly in these colours. Moving up to the three-drops, another unleash beater awaits you in the Hellhole Flailer. The Flailer is the first of its lot we’ve seen that has a second act- for four mana, you can pop it to throw a bit of burn across the table. This is too expensive to feasibly keep open as a response to any removal on a consistent basis, but if you’ve opted to unleash it that’s 20% of your opponent’s life total right there. Even if you can’t always take advantage of them, it’s grand to have options. The other creature here is the deck’s first rare, the Cryptborn Horror. This is the card that makes cards like the Tormented Soul make even more sense, since you need to be able to reliably pile on some damage to make the Horror worth the mana. If you get off to a quick enough start and catch your opponent flat-footed, this can be a turn-3 5/5, which is an immediate and lethal threat. Canyon Minotaurs seem rather drab by comparison, and paying four mana for a 3/3 vanilla can make you feel about the same. Each of the decks we’ve looked at thus far has had some Magic 2013 vanilla fodder- Silvercoat Lions for the Selesnya and Walking Corpses for the Golgari- but this is surely the worst thus far. It’s particularly egregious in light of the high concentration of top-of-curve beaters, meaning the Minotaurs are less vital than the other cards were for their respective decks. Put another way, there’s really not a hole that these are needed to fill. For the same amount of mana (though slightly harder to cast), you get the Bloodfray Giant, a 4/3 with unleash and trample. Climbing to the top of the heap, we find a quintet of closer-level cards to help bring the game to its rightful conclusion. The Zombie Goliaths are another M13 vanilla creature, and are scantly more fun to cast than the Canyon Minotaurs. Still, it’s 4 power on the board. Next up is the Spawn of Rix Maadi, a 5/3 unleash creature. Adding the counter gives you the equivalent of a Craw Wurm for one less mana, though of course with the standard blocking restriction. Pay one more mana (and go up two grades in rarity), and you end up with the deck’s foil premium rare, the Carnival Hellsteed. In addition to unleash, it comes equipped with standard-issue first strike and haste, making it a potent bang for your buck. Alternately, you could pay one more mana, skip the unleash, and end up with something rather like the Minotaur Aggressor, the most expensive card in the deck. But hey… 6 power out of nowhere! The last two creatures are deserving of special mention. The Rix Maadi Guildmage is one of the few non-offensively-minded creatures in the deck. As a multitool utility, you’ll want to keep her behind to use over and over again, either for repeatable pump-removal on creatures that dare to get between you and your opponent, or to drain down your opponent’s life total. The other card is one that has attracted considerable derision, the Sewer Shambler. Sure, it’s a fine fit- a 2/1 with the conditional swampwalk and a relatively inexpensive scavenge cost, but… Golgari? With so much attention devoted to the ‘feel’ of a set, having this card here strikes a terribly dissonant note. To hijack Rosewater’s painting analogy, it’s the equivalent of a blot of ink on the canvas. This is not only because it’s guild-inappropriate, but because it flies in the face of much of what we’ve come to expect from Intro Pack decks. We think a lot about simplicity when building Intro Pack decks. One manifestation of this is that we try to keep at least three vanilla creatures in each Intro Pack deck, as it gives people a break from processing text. Another is that when we include a set’s new mechanic in a deck, like kicker or landfall, we don’t include another new mechanic. Once a prospective player has learned something relatively complicated like infect, we want to reward that person for it, not punish him or her with another equally complicated thing. We’ve discussed before the disappointing omissions from Intro Packs, which seem to be done on a complexity-reduction basis. Traps and Quests are virtually absent in Zendikar/Worldwake decks. Not a single rebound card made it into the Rise of the Eldrazi decks. Good luck finding imprint anywhere in Scars of Mirrodin block. Curses and dual-face cards got the short shrift in Innistrad, and, well… you get the idea. A very puzzling inclusion however you slice it. Tucked away amongst the cacophony of the Rakdos bacchanal is a small, unassuming wee discard suite. It begins with a reprinting of Mind Rot, that classic Core Set staple that’s made an encore in Return to Ravnica (as has Giant Growth, incidentally). Sadly, we’ll never see the likes of Hymn to Tourach again, but this is a reasonable return on your investment, particularly when set up with support. Ravenous Rats, another M13 card originally printed in Urza’s Destiny, makes an appearance here as well. The last discarding card in the deck is Assassin’s Strike. The Strike has a similar feel for discard as what we’ve seen happen to land destruction- up the cost and attempt to balance it out by adding ancillary effects. Here, that ‘ancillary’ effect is more like its primary, as the creature kill will usually guide your hand rather than the discard. Still, given the stodgy nature of removal in the environment, this ranks well alongside Trostani’s Judgment in terms of value. The last card here is the one that ties the suite together: Shrieking Affliction. This joins the long list of Megrim variants like Liliana’s Caress and Bloodchief Ascension that offer support to discard. Frequently, Megrim-type effects are reasonably useful until your opponent simply plays down to no cards in hand, after which they cease to have an effect. The other class of cards that fall into this category are ones that punish your opponent for having nothing left to discard. Like Nyxathid and the Guul Draz Specter, the Affliction is at its best when your opponent is light in the hand. In return for the more conditional trigger, the Affliction offers 50% more damage output to your opponent. Still, it’s probably too ambitious a card to be a quality inclusion here. The Megrims of the world tend to require a deck dedicated to them, and Rakdos Raid ain’t it. It’s a novel taste of what discard is like in the environment, but overall seems a waste of space in the deck. The remaining cards make up the deck’s noncreature support suite. As with any attacking-focused deck, removal plays a huge role in helping to keep the lanes clear. Towards that end, you have a few options here, though again in keeping with the environment they’re a far cry from a Doom Blade. To begin with, in addition to the aforementioned Assassin’s Strike we have a pair of Crippling Blights. Less lethal than a Dead Weight, the Blight nevertheless accomplishes some of what you need removal for in the first place, giving your creatures more room to attack by denying your opponent a blocking option. This makes the card quite a bit better than simple weenie removal. If you need to apply the same penalty more broadly- if only for a turn- you also have recourse to a Cower in Fear. And if none of these do the trick, you’ve also got an Auger Spree which can pull double-duty as a power-pump for your largest beaters. There’s also a pair of Rakdos Keyrunes, keeping the tradition alive. These become 3/1 creatures with first strike, making them particularly welcome. Traitorous Instinct finds reprinting here as a way to take one of your creatures for a ride, though the lack of sacrifice outlets doesn’t let you easily dispose of it before it has to go home. Deviant Glee is an aura that is strictly better than the classic Unholy Strength, while there’s also a Blood Reckoning from Magic 2013 to punish your opponent for daring to strike back. As expected, there’s a copy of the Rakdos Guildgate here as well to help with mana fixing. All in all this looks like a fun deck with a few surprises, and we’ll be testing out unleash in the field. Check back in two days and we’ll have a final verdict! Unleash is imo, the least exciting guild keyword from RtR. They were speculated to be the best guild for the prerelease, but at least at my local store, they didn’t fare that well. The deck itself isn’t bad, but the assault can be blunted by powerful blockers, the kind izzet and azorius have. – The Canyon Minotaurs and Zombie Goliaths are pointless inclusions, both having far better replacements in actual Rakdos cards. – The single Ravenous Rats has no business being in this deck. It doesn’t help the beatdown strategy and it isn’t going to single-handedly create a discard theme. Also, there was actually a suitable replacement in the Ravnica block in the form of Drainpipe Vermin. It wouldn’t have been much better, but at least it was a 1-drop, and in-set. – The Sewer Shambler presumably stopped by to get Rakdos’ autograph, but got packaged into the deck by mistake, since there’s certainly no other reason for the bloody thing to be there. 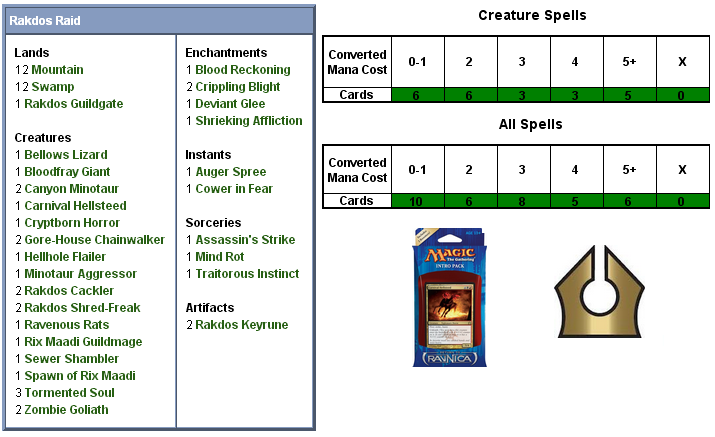 – The Minotaur Aggressor is far to expensive to be in a deck like this. – Shrieking Affliction belongs in a different deck (preferably one which includes more than 3 discard effects). 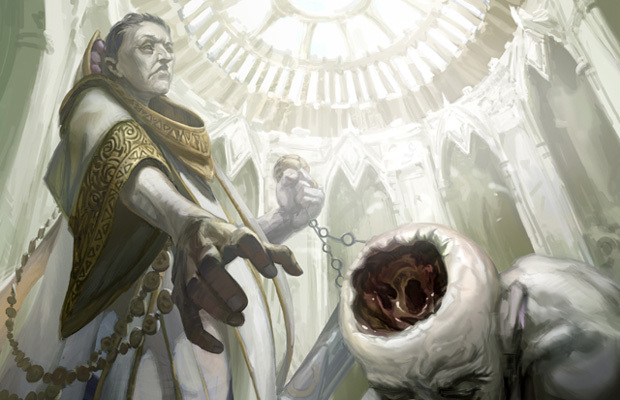 – Blood Reckoning belongs in Orzhov. Finally, this deck is 25 lands. For a supposedly-fast R/B beatdown deck this is appalling. Did no one at wizards think “hmm, if we’re having to put this many lands in the deck, perhaps we should consider trimming some of the top end cards *cough* Zombie Goliath, Minotaur Aggressor *Cough*. I mean, there aren’t even a lot of cards that can take advantage of a lot of mana. In fact, there are 2 – Bellows Lizard and the Guildmage. Terrifying. This deck feels like it really needs trimming at the top end, and expanding at the lower end (1-, 2- and 3-drops especially). Honestly, I’m really not impressed. I’ve already complained about the off-guild inclusions elsewhere, and the MInotaur Aggressor is a really puzzling inclusion, since the vanilla quota has been more than filled already. Deviant Glee goes well on the Souls, if you ignore that unblockable makes the trample ability pointless. What do you expect? Wizards makes possibly ONE good intro pack a set. Since experienced players rarely buy them, they can shove whatever they want in there. Haha, this looks so much like the sealed deck I managed at the prerelease, right down to the 2 rares and the singleton Sewer Shambler. It probably won’t be great shakes among the other RTR precons but it’ll still be a sight better than the old Rakdos deck.